A Day To Think Of Friends Who Never Came Back. Once again, Chesterfield paid its own tribute to the heroes of war as, on the 11th hour of the 11th day of the 11th month, the town joined others across the nation to fall silent and remember those who served, and fell, in wars throughout the last century. 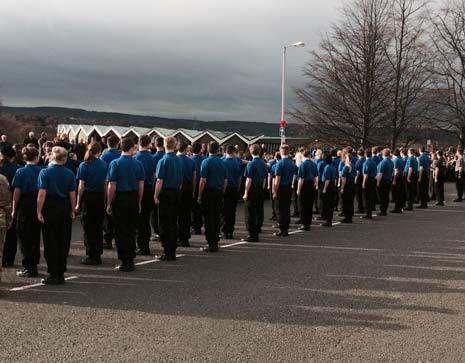 As shops, schools and businesses observed two minutes' silence throughout the towns and villages, several hundred gathered outside the Town Hall to pay their respects to veterans and current servicemen - including several schools, nurseries and Public Services students from Chesterfield College. 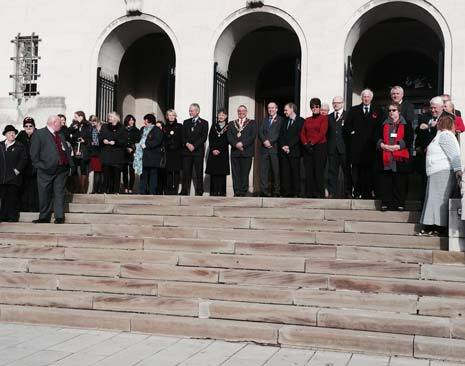 Local dignitaries including the Mayor and Mayoress of Chesterfield, Cllr Barry Bingham and his wife June, CEO of Chesterfield Borough Council, Huw Bowen and Deputy Leader, Terry Gilby, gathered on the Town Hall steps (below), alongside councillors and council employees. As the Market Hall sounded eleven strikes the haunting sounds of the Last Post played by a lone bugler on the Town Hall balcony prompted a two-minute silence, which was impeccably observed. Elderly veterans, some in their nineties, who had braved the windy conditions, left the parade ground to loud applause as the town thanked them for their part in past conflicts, whilst younger veterans who were also in attendance, thought of the their colleagues who lost their lives, and those who remain abroad at scenes of war. One of the younger veterans in attendance was Stephen who had served in NI, Bosnia and Kosovo - and also as a civilian in Iraq and Afghanistan. He admitted he had been humbled by the reaction of the town and delighted to see the support for himself and his colleagues, "It's something that the kids need to realise had happened and needs to be remembered throughout." And, though a public day, Stephen said that Remembrance Day always provokes some very private memories of conflict for those involved, "It's hard as every veteran thinks of it in a different way. I think of the friends I have lost. I'm going to the funeral of a war colleague tomorrow, he was my mentor from the start. Every veteran is different. "Everyone will think of something different on a day like this - but predominantly, it will be of friends that have been lost or injured - of friends that never came back." Children from several local schools - including Little Leprechauns (above), - had been invited to the ceremony by the Mayor - and Old Hall, and Poolsbrook pupils attended not only the service, but also had the chance to speak with veterans before and afterwards in the Mayoral Rooms (below), an opportunity, a teacher told us, that was extremely valuable for the pupils. 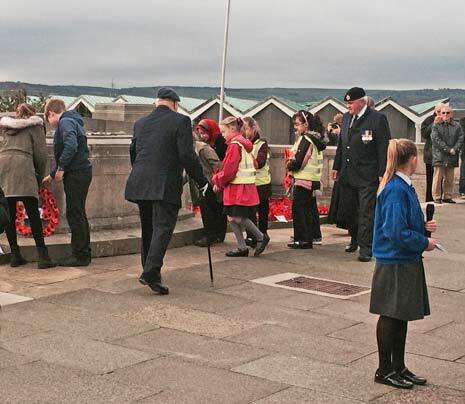 Mr Lawrence from Old Hall Junior school said it had been a powerful bonding experience for both pupils and former soldiers, "It brings the learning to life, gives them reality and connects them to the older generation. It's meant a lot to the older generation too as I can tell from the experience this morning. 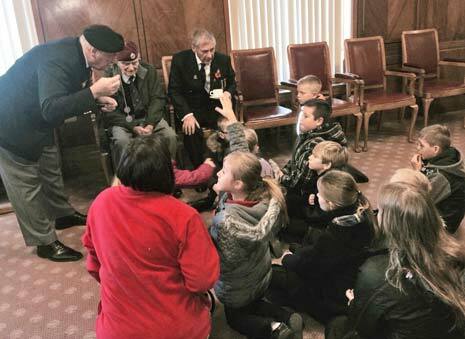 "We have been to the Mayor's parlour and talked to veterans and it's brought to life the classroom learning. One of our pupils was picked to read part of a poem; she kept very composed and was given a part in the service. We had 30 volunteers and had to pick her name out of the hat! It's a very valuable experience, very memorable - we've done it for about six years now!" 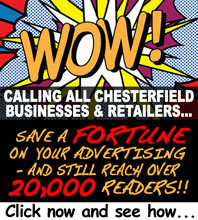 Cllr Terry Gilby, Deputy Leader of Chesterfield Borough Council, told The Chesterfield Post that he too had been overwhelmed by the support of the town, "I thought it was an impressive turnout with lots of children and students from Chesterfield College. It is really good for the veterans to see so many people there - it must lift their spirits to know that people do remember. "The British Legion does so well for the servicemen, as so many people have returned from war needing a lot of help. 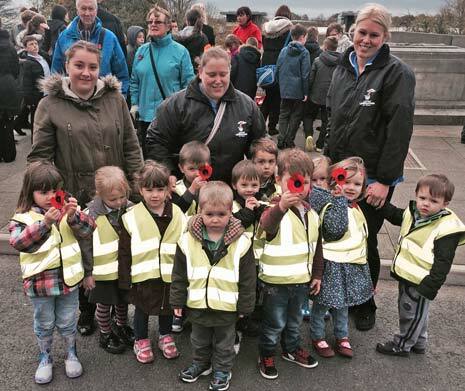 We are really proud of our military connections in Chesterfield and we work very closely with the Royal British Legion and will continue to do so."